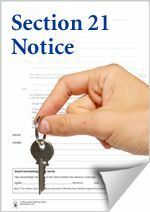 This guide explains two methods of giving a tenant notice to quit. Landlords can evict tenants who rent through an assured shorthold tenancy by using a Section 21 or Section 8 notice. TENANT SECTION 21 NOTICE: Use this eviction notice if you want to take back your property and gain possession after the fixed term rental ends. The official title in the courts of England and Wales is a 'Notice Requiring Possession (under section 21 of the Housing Act 1988)'. TENANT SECTION 8 NOTICE: Use this eviction notice if your tenants have broken terms of the tenancy agreement. The official title used in the courts is a 'section 8 possession notice'. This is because it operates under section 8 of the Housing Act 1988. A written tenancy agreement with a specific fixed term that has ended. An oral or written 'periodic' tenancy agreement with no fixed end date (e.g. week-by-week or month-by-month). Note: Did the tenancy start after April 2007? If so you can only use a Section 21 notice if the tenant deposit got secured in a deposit protection scheme. Landlords must give adequate notice to leave when they serve a Section 21 notice. Filling in Section 21 notice form 6a: If the tenancy started on or after 1 October 2015. Writing your own notice: If the tenancy started before the 1st of October 2015. Explain that you are serving notice under Section 21 of the Housing Act 1988. Note: It is often best to get legal representation before creating an eviction notice and serving it to tenants. Landlords cannot evict fixed-term tenants until their tenancy ends. So the notice must end on the last day of the rental period if the fixed term has already expired. That means you need to give more than 2 months' notice if the rental period was longer than 2 months. An example could be if it got paid quarterly. What Happens After You Give Notice? Complete the certification of service form (N215). Write 'served by [your name] on [the date]' on the eviction notice. Some tenants may not leave the property by the specified date on the notice to quit. In this case you can use your completed N215 or notice to apply for an accelerated possession order. Landlords can use a Section 8 eviction notice you give to their tenants. Fill in a 'Notice seeking possession of a property let on an assured tenancy or an assured agricultural occupancy'. You can serve between 2 weeks' and 2 months' eviction notice with this method. It depends on which terms of the tenancy your tenants broke. Apply to the court for a possession order if your tenants fail to leave the property by the specified date. Note: It is often best to find legal advice before filling in a Section 8 notice to quit form and serving it to tenants.